This recipe takes me way back to when I'd first enjoyed some Tava vegetables. It was at a party that had a huge buffet offering, both non-vegetarian and vegetarian. While the non-vegetarian spread was really impressive, I was intrigued by a live stall happening over on the veggie side of the table. There was a massive tava (cast iron griddle) and it had a variety of vegetables on it. The aroma was deliciously intoxicating and I knew I had to try some. I helped myself to a small assortment, some salads and took some naan bread to go along with it. Little did I know that this dish would have me hooked for a long time to come. This was about 7 years ago, I think. To this day, the thought of those tava vegetables has me yearning for some. After a lot of searching, high and low, I found a recipe, that I tweaked to try and replicate the flavors I so vividly remember. Since I cook for just my husband and I, this recipe is scaled down. 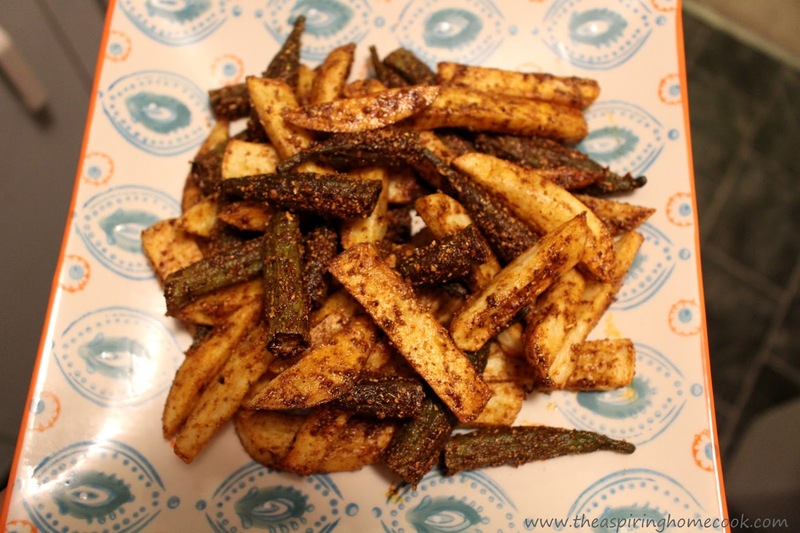 I also just use my favorite veggies from that day - okra (bhindi) and potatoes (aloo). I found that these are also some of the easy ones to work with. I don't make this recipe very often, because the veggies start off by getting deep fried and are then tossed with a spice mix (tava masala), and the deep frying tips this to the slightly indulgent side. So try this easy stir fry recipe. This is best enjoyed served hot with some chapatis, rotis, naan or other flatbread of your choice. It would also work well as a side dish to some hearty Dal & Rice. Place a pan with the oil for deep frying on medium high heat. Wash and peel the potatoes and cut into evenly sized fries / chips. Wash the okra and pat dry. Chop the stalks off the okra and discard. Try and use okra that is similar in size, if not, cut them down to about the same size as the potato pieces. By now, the oil should be hot. Carefully, and in batches, add the potatoes to the oil. Don't overcrowd the pan or the oil will froth over and spill. Deep fry the potatoes on medium heat till they've cooked through. Drain using a slotted spoon and set aside on some kitchen paper to get rid of any excess oil. Deep fry the okra on medium heat till they have start getting a little darker in color and have started crisping up. Drain using a slotted spoon and set aside on some kitchen paper to get rid of any excess oil, like you did the potatoes. Take the oil for deep frying off the heat. Heat 1 tbsp oil in a large pan on medium heat. When the oil is warm, NOT hot, add in the turmeric powder first and then add the rest of the spice powders. Stir that through for about 20-30 seconds or till the spices get aromatic. Add the okra to the pan and toss well. Lastly add the potatoes and toss to coat the veggies with the spices evenly. Check for seasoning and add salt, to taste. Toss well.